I was wondering how Apple and Samsung where doing in regards of SAR (Specific Absorption Rates) values for mobile phones so on this post I am going to share with you where some of their most known devices stand. Mobile phones use high frequency electromagnetic fields for voice and data transmission. When you talk to someone with your mobile phone, the energy of these fields is party absorbed in the head (unless you are using a headset) or by your body if the device is for example, in your pocket. SAR is measured in Watt per Kilogram, in order to avoid adverse health effects, the specific SAR for mobile phones cannot exceed 2 Watts per Kilogram. Currently there are no mobile phones in the market that exceed this recommended number, still I think it might be a good idea to consider the SAR value before making a purchase, or not? Back in 2003 I used for less than few days a Slate Windows Tablet PC based on Windows XP. I liked the stylus idea, but the experience was not so great, especially because most applications where not yet designed for this. Since then, the tablet situation has changed a lot. With Vista and then 7, tablet pcs evolved, and while the stylus was getting better, the rest of the hardware was still far from perfect: heavy, low battery life (expect 2 hours and a half at best). Then came the iPad, which changed a lot the state of the art for the slates: good battery life, light, but with a mobile OS and its limitations and no stylus. Then came Surface, and Surface Pro. 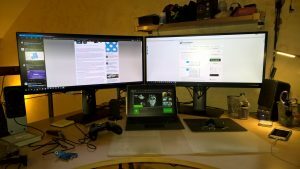 I will focus this piece on Surface Pro 4, which replaced my previous 2 years and a half old Surface Pro 2 one month and a half ago. 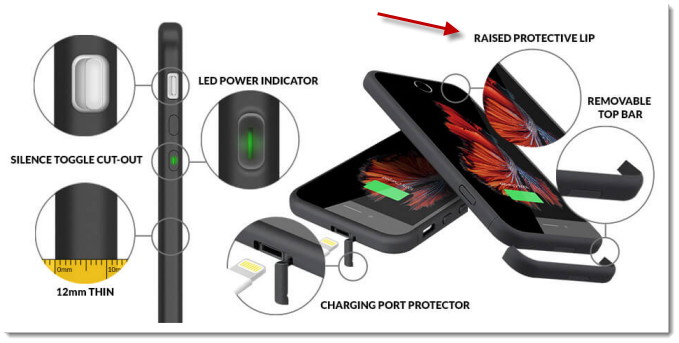 Some time back I supported the Indiegogo project of ThinCase, a product which looked very promising, claiming to deliver a battery case for your iPhone in a very small form factor. I supported the project because I really wanted to see something like this. Some weeks back, I received the case and started using it for a while to test how it would work. To be honest although the quality was not great, it was ok. Until one day I noticed that the screen seemed to be exposed to scratches if I would lay down my phone on a flat surface (something we all do at some point). Just to be sure, I checked how the guys at ChargeTech were promoting the case. They are offering a “raised protective lip” as they called it, but this is not working as it should at all. I contacted them to check if the product was defected, they answered that the product “is designed like that”. To be honest, their support level was not very good as I had to contact them again because they didn’t reply to my first email (to a Gmail account by the way). What a pity that such a promising product failed on something so basic as protecting the screen. Back in December I was writing a post about how 2015. if done properly, could be the year of the return of Microsoft. With yesterday’s Microsoft hardware event and the success of Windows 10 being installed in more than 110 million computers in less than 3 months of being released, we can confirm it certainly is. The Redmond giant was able to turn around a negative number of the Surface family with the just wrong Windows RT approach, into good profit by changing the strategy a few generations back. The new Surface lineup with Windows 10 as the driving operating system for all their end user devices, this can only get better. Yes, the company that you thought would never have a problem like this, because of their design and fabrication “High standards” is actually having a problem that will definitely have a negative effect on their image. I personally would have never thought that Apple would have an issue like this…clearly, they could have done better and maybe focus on testing their phones properly instead of being focused on the secrecy part. I don’t understand how companies of this size, with thousands of people working on the project and millions of dollars invested in R&D have this type of problems. You have to remember, the iPhone 6 Plus 128 GB costs almost USD 1000, so I think you should expect top quality for this price. Its going to be interesting to see if their stock value will be affected by this. Apple didn’t comment on the matter till the moment I’ve published this post. Since Apple introduced the lightning connector on their devices, it has been a very nice experience. You dont have to figure out on which side the connector should be plugged because it would work either way (contrary to the micro usb plug). Unfortunately, not everything that shines is gold, and I found myself in several situations where I would love to have a lightning adapter with me. You probably feel identified with this situation: You are on a place where several people around you only have micro usb char gers so you can’t charge your iPhone :(. Lets face it, its really uncomfortable to carry a 1m cable on your pocket, and even so, remembering to always take it with you is another hassle. 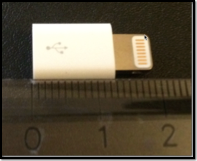 In Europe, the micro USB connector has been set as a standard for mobile devices, so Apple is obliged to at least sell an adapter that would allow you to use any micro USB cable with their lightning devices. I wanted to test this, and today I received the Apple adaptor I purchased online. Some days ago, I wrote about how Apple is making their own docks for iPhone 5 and 5S incompatible with their own phones if the device is inside one of their own cases. On that post I commented that I found a dock in China which seems to offer what I was searching for. Today I received it and I must say, ITS GREAT! It comes beautifully packaged in a box with protective material. The quality is amazingly great, and it comes in Black or White. A lot of us use our smartphones everyday. But, are we using them wisely? Next time you use your device, ask yourself if you are not missing what is really going on around you. Apple is one of the most important technological companies in the world, they invest billions in research and development to bring us super cool, powerful and functional products. I have several of them actually and I really like them, yet, they fail to deliver a simple thing: A dock compatible with their own cases! 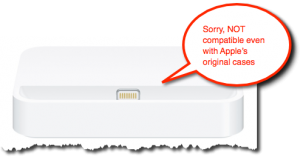 This is not the first time they make this mistake, (yes I am assuming its a mistake), in the past I remember having an iPhone 4S and having exactly the same problem, with their own bumper it was almost impossible to find a dock compatible with their device. I ended finding a dock in China that was available with a longer 30 pin connector that would allow me to use my case with it.